The Queens House of Detention at 126-02 82nd Ave. closed 15 years ago. QUEENS — The plan to close Rikers Island in 10 years and move inmates to smaller jails around the city — backed by Mayor Bill de Blasio and a local councilwoman — has stirred concerns among Kew Gardens residents about the possible reopening of a long-vacant detention center. The Queens House of Detention at 126-02 82nd Ave. closed 15 years ago — roughly four decades after it first opened behind the Queens Criminal Court. 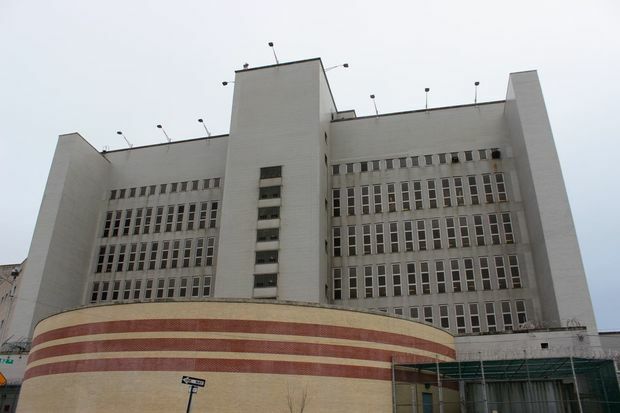 The building, which once housed more than 300 prisoners, is now occasionally used as space for television and movie production filming as well as for staff training, according to the city's Department of Correction. Last year, DNAinfo New York reported that the city was looking into closing Rikers and placing smaller jails around the five boroughs. De Blasio flatly denied the story at the time, but last week, a group looking at alternatives for Rikers released a report recommending its closure and the movement toward locating corrections facilities in communities. The Mayor's office would not specify whether the Queens House of Detention is being considered as a potential site, and the DOC referred questions about the future of the building to City Hall. Kew Gardens residents say they worry that it once again could become a correctional facility. “It would ruin the neighborhood,” said Michael Raifaisen, 54, a commercial real estate broker who has lived in the area for 15 years. “There is this perception that when you open a jail facility in a certain neighborhood the property values will go down,” he said, adding that jails also bring “people who are undesirable” to the area. Andrea Crawford, a Kew Gardens resident and member of Community Board 9, said she had mixed feelings about the possible reopening of the detention facility. “The neighborhood is highly residential and things like perhaps more traffic, overcrowding ... and things that come along with nighttime transport could have a negative impact on the surrounding community,” she said. “However, on the flip side we already have the criminal court there,” said Crawford, adding that CB9 should discuss the issue at its upcoming April meeting. Queens District Attorney Richard Brown, who called the plan to close down Rikers Island "unrealistic," said that the Queens House of Detention could be put to better use as office space. He told the Independent Commission on NYC Criminal Justice and Incarceration Reform last October that using it as office space instead of a jail would save the city over three million dollars a year on rent which it currently pays to house the DA's office in a privately-owned building. But local Councilwoman Karen Koslowitz said she would support reopening of the Kew Gardens facility. He also added that "when the Queens House of Detention was open, [Koslowitz] wasn’t aware of any complaints about the facility." Appearing Monday on NY1’s Road To City Hall, de Blasio did not mention any specific neighborhoods where new jails could be built. But he said that the process “has to now go through a very long public discussion." He also noted that while he was pleased that several council members supported the plan, he was also aware that they could change their minds once community process begins.